We are a team of 30+ people, we’re the largest Australian startup accelerator and have been around for more than six years. We’ve had 3 exits, 1 IPO, and our startups grow in value every month ($500M combined value and counting). We are a local team for founders, with global connections. We exist to empower early-stage startup founders to build impactful, investable global tech startups that solve the world’s greatest challenges. Through our accelerator programs and corporate partners, our founders unlock the best possible opportunity to succeed. Created more than 1100 jobs. What does BlueChilli offers all BlueChillians? FLEXIBLE WORK ENVIRONMENT – We have very deliberately built the dream team of innovation heavyhitters. We take this task seriously! Everyone in the team is so fantastic that they could choose to work anywhere they please. We take great pride that they choose to do their best work here. It is our job to make sure that this choice is the easiest one they have to make! AWESOME OFFICES – The BlueChilli office is the veritable wishlist of any startup founder or tech pro. The Sydney headquarters is decked out with everything you could need to boost creative confidence and experimentation. Our workspace welcomes four-legged companions, too! FREEDOM & AUTONOMY – Work-life balance is crucial at BlueChilli. The team has taken big steps to ensure everyone can bring their best selves to work. Starting with flexible work environments, including both complete flexible hours and the ability to work from home at a moment’s notice. Giving everybody the freedom to own their time, we ensure that each and everyone in our team is working from the place that makes him or her the happiest. AWESOME DAY- BlueChilli gives everyone a yearly AwesomeDay – a whole day free to use on anything they choose to. This day doesn’t count against annual or sick leave. It’s a free day to use for inspiration, recharging or simply enjoying life! You also get your birthday off…. 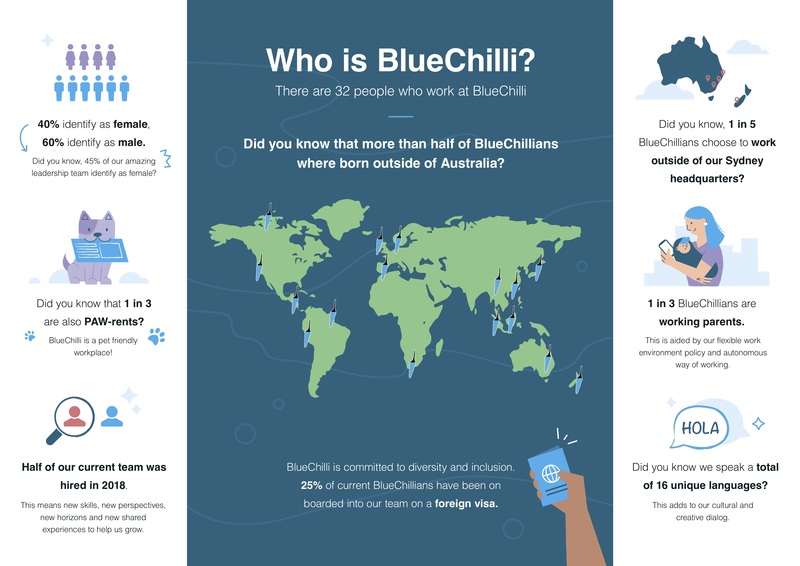 INCENTIVE PROGRAM – BlueChilli is making investments in ensuring the the team and broader ecosystem is the best in the world.